A diagnosis of Alzheimer’s doesn’t only affect person with the disease; it affects the whole family, particularly the caregiver. But you may not realize just how much toll it takes on the caregiver until you’re actually living it. 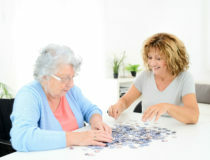 Even more surprising, the number of people who selflessly fulfill this role: over 16 million people provide unpaid care for family or friends with this disease according to the Alzheimer’s Association. Caregivers are special people in an immensely rewarding role, but it’s often one that catches you unprepared for the financial, emotional and physical strain. A 2016 study by the Alzheimer’s Association found that on average, caregivers spent $5,155 of their own money per year caring for their loved ones. The impact extends from dipping into savings and retirement funds to pay for daily expenses, to cutting back on necessities like food and their own healthcare. 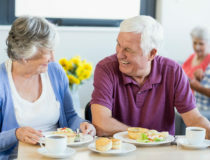 According to the study, Alzheimer’s caregivers are 28 percent more likely than non-caregivers to go hungry because they could not afford to eat proper meals. Not only is it devastating to watch your loved one struggle through the stages of Alzheimer’s disease, it can be overwhelming to care for them as well. As such, caregivers commonly experience high levels of stress as well as social withdrawal, anxiety, depression, exhaustion, sleeplessness, irritability and lack of concentration. What’s more, the Alzheimer’s Association notes approximately one-quarter of caregivers are “sandwich generation” caregivers; meaning that they also care for children under age 18. And shockingly, a recent Stanford Medicine study reports that 40 percent of Alzheimer’s caregivers actually die before their loved one. What can you do? Caring for your loved one is a beautiful thing, but there are options to make the most of the situation for you and your loved one. There are a number of resources in which you can turn for advice and support. The Alzheimer’s Association (Alz.org) and the Family Caregiver Alliance (Caregiver.org) offer a wealth of resources for caregivers. Also, we at Sonata are always here for you. Learning all you can about the disease, its progression and assisted living caregiving tips can help you become more confident and empowered in planning for the future and dealing with problems that arise. Is it time for more help than you can give? Asked by all caregivers at some point, it’s a question only you can answer. But, if you’re becoming more concerned about your loved one’s safety, health, emotional state and access to social stimulation as well as activities to strengthen cognitive function it could be time for an advanced level of care. Memory care communities such as Sonata’s Serenades nurture those with Alzheimer’s disease through specifically trained staff, individualized support and 24-hour assistance. Here you can expect a private or semi-private apartment, three meals daily, medication management, cognitive and physical therapy, fitness programs, social activities and even housekeeping and laundry services. In fact, Serenades memory care has received back-to-back Best of the Best awards from the Assisted Living Federation of America (now Argentum) for our purpose-built design, person-centered care and programming. Memory care provides advantages for you as well such as the ability to be daughter, son, husband or wife again versus a caregiver. 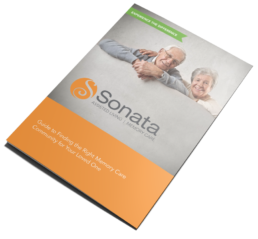 Plus, our Sonata partners with the whole family, not just the resident so you will still be an integral part in your loved one’s care.